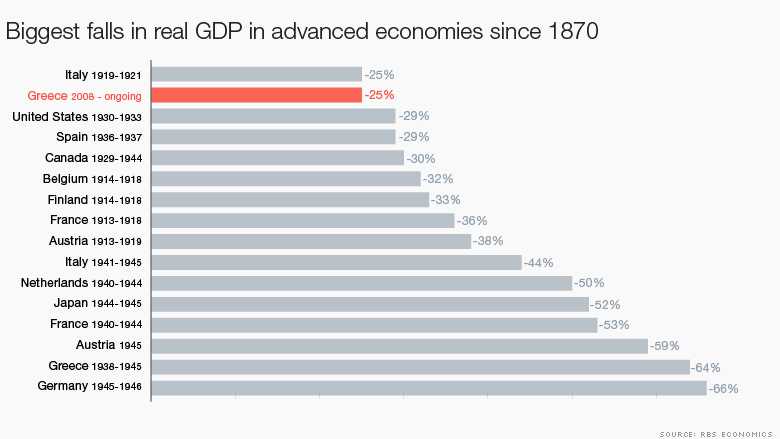 Greece's economic collapse is on par with America's Great Depression and similar to a country at war. It's not far off from what European nations saw during World War I and World War II, according to research from Royal Bank of Scotland. Greece's economic output -- known as GDP -- has fallen 25% since 2008. It's a nearly unprecedented peace-time decline for a developed country. "Among modern depressions -- Finland in the 1990s, Ireland or Iceland -- Greece dwarfs all," says Rupert Seggins, senior economic advisor at Royal Bank of Scotland. Still declining: Greece has been in economic crisis for seven years. While the U.S. saw a bigger initial economic drop during the Great Depression than Greece has, America was well on the way to recovery seven years later. For both GDP and jobs, "the U.S. had already recovered by this stage in the crisis," says Seggins. On Sunday, Greeks overwhelming voted "no" on a referendum on Europe's latest bailout offer. Many Greeks do not want further cuts to their government, which have come to be known as "austerity measures." What's next for Greece is still an open question as the country has €323 billion ($360 billion) in debt left to repay and little hope of jumpstarting its economy enough to grow out of its problems. On top of that, Greece has made tremendous cuts in recent years to its government budget, which drags down the economy further. "The scale of austerity has been astronomic in Greece. We struggled to find any comparable amount of austerity for any advanced economy since 1980," says Seggins. There are three main reasons why Greece is in such a bind -- far more so than the debt troubles that plagued Ireland or Spain. When an economy is in trouble, one of the easiest solutions is to market the fact that a country is a cheap place to do business -- and to buy goods from. It's like putting up the "sale" sign in a store, except in this case the store is an entire country. Portugal, Italy and Spain have all been able to export more goods since the Great Recession. That has helped their economies find new life. But Greece hasn't been that lucky. It is exporting about the same amount that it did in 2008, according to data compiled by RBS economics. Another popular way to get an economy going again is for the government to increase spending. That's what America did after the financial crisis when it passed various stimulus measures to build more roads and even give people tax refunds. But Greece hasn't been able to do that. In order to receive some aid from Europe and the International Monetary Fund, Greece has had to do tough cuts -- far more than Iceland or Ireland if you look at the reductions as a percentage of GDP. A final recipe for resuscitating an economy is to devalue the currency. That makes the debt easier to repay and goods cheaper so the country can export more. But Greece can't do that because it's part of the euro and Greece doesn't have much influence on the value of the euro. It's a straight jacket that's similar to how countries used to be on the gold standard. 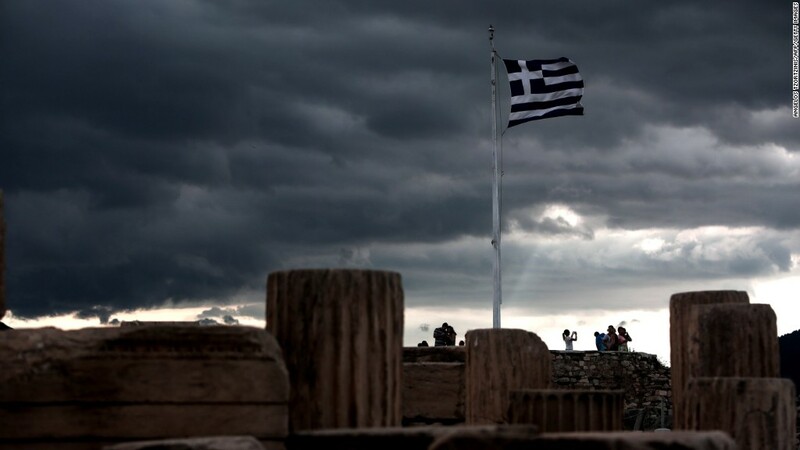 The result is Greece has had to try to adjust its economy by lowering wages and raising unemployment, causing further economic pain, and that's why some experts believe Greece will have to leave the euro (the "Grexit") to have the best shot at getting its economy back on track.